Palm Oil is produced from the fruit of the oil palm or Elaeis Guinnesis tree, which originated in West Guinea and it is not the same as coconut palm trees. The Oil from the palm fruit produces two oils, palm oil from the fleshy mesocarp and palm kernel oil from the seed (kernel). 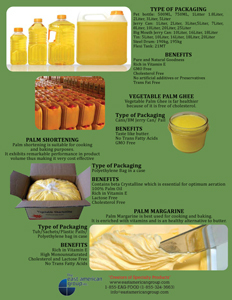 Palm oil is a unique ingredient and it is used in many products. Primarily in food products: cooking oil, shortening, margarine, milk fat replacer and cocoa butter substitute. It has great cooking properties and it maintains its properties even under high temperatures. Its smooth and creamy texture and absence of smell make it a perfect ingredient in many recipes, including baked goods (such as biscuits) in particular. It has a natural preservative effect which extends the shelf life of food products. Palm kernel oil is mostly used in the oleo chemical industry for making soap, detergent, toiletries and cosmetics. 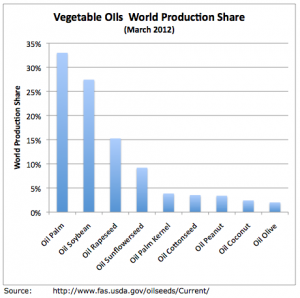 Palm oil is the No.1 most widely produced and consumed oil in the world. We market crude palm oil, crude palm kernel oil (PKO), high oleic palm olein, RBD palm fractions, palm fatty acid distillate and palm kernel stearin. The Red Palm oil is very popular and maintains the natural nutrients of carotenes (precursors to Vitamin A) and the antioxidant tocotrienols (Vitamin E). Typical RBD (Refined, Bleached, and Deodorized) palm oil has these nutrients stripped from them resulting in clear oil. 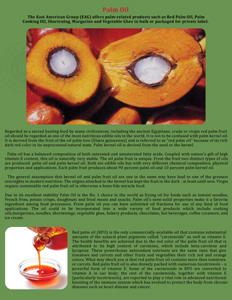 In its natural state, palm oil is red in color due to a high concentration of carotenes and tocols. The red palm oil is one of your best sources for Vitamin E.
Our production of Palm Oil comes from several countries.